MF Doom had a clutch of underground-rap classics under his belt when he teamed up with producer and Stones Throw cohort Madlib for the Madvillain project. The duo was indeed dynamic, spiraling out vignettes that crackled with comic book whimsy and intrigue. Madvillainy's beats, rhymes, skits and samples blend seamlessly, as if the racing thoughts of a mad genius. 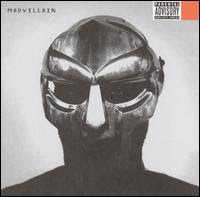 The supervillain theme plays right into Doom's hands, and he takes on the varying roles with gusto, whether shining in the glare of a club spotlight ("Rhinestone Cowboy") or presiding over the imaginary opulence of the "Madvillain Bistro Bed & Breakfast Bar & Grill Cafe-Lounge on the water" ("Bistro"). His gobs of pop culture references dovetail with the scraps of dialogue mined from old TV shows and radio broadcasts, begetting a vortex where the expression "egads" sidles up to "true that." Humor abounds, with the emcee taking on halitosis in "Operation Lifesaver Aka Mint Test" (choice line: "Fellas don't fess / some of 'em just need to eat the whole thing of Crest"). Madlib, playing his Quasimoto character, gets in on the vocal action, fostering some friendly competition on "America's Most Blunted." Given the overall zaniness, Madvillainy's crystallization of romantic betrayal on "Fancy Clown" is unexpected and stirring. Having first weathered the blow of being cheated on, the supervillian feels burning embarrassment when word makes it around on the street, and his reaction is a mixture of lashing out at his lover and, believe it or not, blaming himself. It's a moment that rounds the cartoonish characters, pulling back the mask to show a mortal man beneath. Hope this helps you like it helped me. Try Oraltech Labs as it worked for me, although I will say it's not just do this and "bam your breath is cured" as they make you change your entire mouth cleaning habits. So you end up doing it all their way. But in the end it becomes a daily routine. It covers Post Nasal Drip and Tonsil Stones as well thankfully. When you have bad breath it messes up your whole life. And I suppose the best thing is they don't make you go out buying "special" products for the rest of your life. So try Oraltech Labs. Just don't get it and then think you'll do what it says “now and then” because it's either all or nothing, and trust me getting rid of my room clearing faecal breath meant I was all in. Alex’s, J. USA.